I bought it because I heard this quote recently"A child kicks its legs rhythmically through excess, not absence, of life. Because children have abounding vitality, because they are in spirit fierce and free, therefore they want things repeated and unchanged. They always say, "Do it again"; and the grown-up person does it again until he is nearly dead. For grown-up people are not strong enough to exult in monotony. But perhaps God is strong enough... It is possible that God says every morning, "Do it again," to the sun; and every evening, "Do it again," to the moon. It may not be automatic necessity that makes all daisies alike: it may be that God makes every daisy separately, but has never got tired of making them. It may be that He has the eternal appetite of infancy; for we have sinned and grown old, and our Father is younger than we. "So far, the book is living up to my expectations. Absolutely brilliant in approach, style and process. It is an autobiography, of sorts. Essays in apologetics, of sorts. Chesterton states it this way in the preface "I did try to found a heresy of my own; and when I had put the last touches to it, I discovered that it was orthodoxy. "Chesterton is a captivating author, not only in the concepts presented but also in the way he tells them. All that to say, so far, it's amazing. You should read it! I have to think of Chesterton as happy nitroglycerin. This book sends your head up into the clouds while driving your feet deep into the earth. It spins you dizzier than you've ever been, yet makes you walk straighter than you've ever walked. Read this first in 2007, again in 2011. It is with extreme reluctance that I condemn this work as worthless. The person who recommended it to me is one whose opinion and learning I respect greatly.Chesterton seems to think (although I'm not entirely sure of anything in this book, inasmuch as the author refuses to write in anything but figurative language and metaphor. In fact, the term "mixed metaphor" is an entirely inappropriate descriptor. One would need to use exponents to keep track of the metaphors and smilies that he heaps upon one another in the attempt to explain his position) that Christianity, has achieved some miraculous balance, solved some insolvable paradox. Just what sort of paradox? I'm not entirely sure. He throws around labels like pessimist, optimist, anarchist, agnostic, atheist, anti-Christian, Modernist, rationalist, mild-rationalist, pagan, Christian, Christian Scientist, and quite many more, I assure you, without ever deigning so much as to provide even rough definitions of what he means. His argument is that Christianity leads to sanity, and anyone who argues otherwise is a damn (though thankfully not a damned) fool: "Perhaps, after all, it is Christianity that is sane and all its critics that are mad." (166)But my favourite line has to be: "Our grandmothers were quite right when they said that Tom Paine and the free-thinkers unsettled the mind. They do. They unsettled mine horribly." (154) And it's those blasted "free-thinkers," according to Chesterton, who perpetrated this insidious and invidious idea that life itself is full of problems and uncertainty. For shame! It is only within the Christian context that one can find a worry-free and jolly existence. For you see, Christianity solves all of life's mysterious contradictions, for it is itself one giant and glorified contradiction. And just how does Christianity function thus? Here it is straight from the horse's mouth: "All that I am urging here can be expressed by saying that Christianity sought to keep two colours co-existent but pure. It is not a mixture like russet or purple, it is rather like a shot silk, for a shot silk is always at right angles, and is in the pattern of the cross." (174) Now why didn't I think of that?! This is an absolute must for either Catholics or Protestants, as Chesterton addresses an aspect of mere Christianity (it's profound and monumental common sensensicalness!) in a way that sparkles with wit, humor, and intellectual derring-do.Incidentally, if you set yourself to reading it out loud, you will put yourself through a training in diction and oral expression that far surpasses anything you could ever hire. imagine walking into a dangerous and violent bar with the biggest, baddest ufc champion ever to grace the octagon. or walking into a house party with the hottest date ever. or entering a church basketball tournament with an nba caliber ringer on your team. i'm guessing that's what it would have felt like to walk with gk chesterton into a room full of skeptics and post-modern christian haters. okay, that whole paragraph did not work. but this book deserves credit for being mostly a pre-modern work that predicts most of the 20th century. Superb. Finished it again in January 2017. I learned that the Orthodoxy of the Catholic faith is what keeps it (and the world) sane. It calls to us from our fairy tales while at the same time appealing to our logic.I also learned why so many people, like C.S. Lewis, Scott Hahn, and J.R.R. Tolkien have made reference to G.K. Chesterton - he is brilliant. His mastery of the English language is second to none.The only difficulty of this book is that it may come off as "high-brow" because it was written in the U.K. (and their English is different from American English) at the beginning of the 20th century. Once you can get past that, you will see how the words of our language make plain the Word of God. I first read this in 1975. It was a life-saver then. Not sure how many times I have read it since, but Nancy and I just finished reading it aloud together (May 2013). Fantastic, as always. "Things can be irrelevant to the proposition that Christianity is false, but nothing can be irrelevant to the proposition that Christianity is true. "Certainly nothing is irrelevant to discussing Christianity when G.K. Chesterton writes a classic apologetics work. Orthodoxy is and is not a typical apologetics work. It defends the orthodox Christian world-view and it moreover discusses and reveals what Chesterton's own views and values were. As such Chesterton does not back away from discussing as broad a range of topics as possible. He moves from ideologies to science to philosophy and to literature both criticising and appraising other values, ultimately holding a sustained argument that discusses that, as he sees it, Christianity can be defended both logically and emotionally.For those who ask whether such a book holds value today Chesterton can still defend himself. He defends with the subtle wit of a genius and he is a thinker who builds strong argument upon strong argument. "Some dogma, we are told, was credible in the 12th century, but is not credible in the 20th. You might as well believe that a certain philosophy can be believed on Mondays but not on Tuesdays." The same idea holds I believe for this book. It is applicable today as it was in the 1900s.I've chosen a few chapters that particularly appealed to me and have tried to summarise what I saw in them of interest. The Maniac"'The men who really believe in themselves are all in lunatic asylums ... Believing utterly in one's self is a hysterical and superstitious belief like believing in Joanna Southcoate: the man who has it has 'Hanwell' written on his face as plain as it is written on that omnibus. 'And to all this my friend the publisher made this very deep and effective reply, 'Well, if a man is not to believe in himself, in what is he to believe? 'After a long pause I replied, 'I will go home and write a book in answer to that question.' This is the book that I have written in answer to it. "In this second chapter, following a brief introduction, Chesterton explores the nature of madness. He challenges the idea which claims poets as being mad due to their artistic nature. It is not artistic endeavour which creates madness, Chesterton insists, it is too much reason. "Poetry is sane because it floats easily in an infinite sea; reason seeks to cross the infinite sea and so make it finite. "There is a sense that Chesterton is setting up his argument to reveal first and foremost that the world we live in is one of both reason and wonder. He questions the nature of the world that we can both accept something as old and still find something new within it regularly. He does not aim to state that reason is bad, he later suggests that reasoning is important. However his argument is about reason without imagination or 'wonder.' For that is Chesterton's insanity that he argues about. "It is the logician that seeks to get the heavens into his head. And it is his head that splits. "The flag of the worldChesterton here discusses the idea of jingoism, relying on that as a concept for how people may approach the world. His argument is that as we all have various patriotic ties so too we may have patriotic ties that link to our worldviews. This idea is particularly extended to reveal that the jingo version of a view is one that does not actually love that which it claims to love. A jingo love for democracy does not actually love the people which it is meant to love but rather loves the idea of democracy in other words.The Paradoxes of ChristianityThis chapter was one of my favourites. I feel that Chesterton is at his best when utilising or discussing paradoxical situations. He appears to understand them better than any other author I've read. In this chapter Chesterton discussed his personal reaction to what he terms the paradoxes of Christianity. This being that Christianity is a bad religion because of the arguments made that a)its followers are too passive (due to the 'turn the other cheek' mentality) and also b)too violent (due to the crusades). "This puzzled me; the charges seemed inconsistent. Christianity could not at once be the black mask on a white world, and also the white mask on a black world. "This discussion appealed to me because I think Chesterton highlighted a key point. The element of humanity involvement with any belief. Christianity as an ideal belief is pure, it is the hypocritical and double-thinking element of man which makes it into any paradoxical idea. Conclusion"We must have in us enough reverence for all things outside us to make us tread fearfully on the grass. We must also have enough disdain for all things outside us to make us, on due occasion, spit at the stars. "It appears to me that Chesterton's argument ultimately boils down into the call for a return to an orthodox faith which is practical theology. I feel that this belief is what is needed in today's sceptical world. Belief which can be used in reality. "Christianity, even when watered down, is hot enough to boil all modern society to rags."G.K. Chesterton may appear too condescending to some and too self-deprecating to others. I cannot help but wonder if he, the prince of paradox, would have found that somewhat amusing. On the whole however I find his writing to be full of wit, humour, irony, sarcasm and above all wisdom. His way of stating his opinions in a manner that is forceful and commanding and yet rarely resorts to dictatorial preaching is something I want to see more of in today's individuals. Surely the gift of defending one's beliefs has not died out in the past century and surely the gift of writing about and with paradox can be found in other authors? I surely hope so. "If I say, 'A peasant saw a ghost,' I am told, 'But peasants are so credulous.' If I ask, 'Why credulous?' The only answer is - that they see ghosts." Chesterton was one of the premier Christian thinkers of his generation, fully engaged in the intellectual debates of his day (which turn out to be not much different from those of our own!). His writing is frequently characterized by love of paradox, exuberant humor, and intellectual rigor which can make his thought demanding to follow in places (a quality mitigated by his clear effort to tailor the presentation to the average educated reader). All of those qualities are in evidence here. It's also important to keep in mind the purpose of the book; he's not trying to lay out a universally rounded, all-bases-covered systematic apologia for Christianity. Rather, he sets himself the much more limited task of indicating the psychological processes behind his own initial and continued acceptance of Christian belief. He invites the reader to follow his thoughts and feelings; how much apologetic value they have will depend on the degree to which individual readers can relate to them. (The book is also not --though its title might create that impression-- an attempt to provide an exhaustive and "authoritative" hair-splitting definition of just what "orthodoxy" believes; which is fortunate, since I tend to be suspicious of and impatient with such attempts at rigid definition. :-))As the Goodreads description of the book indicates, Chesterton makes it clear that his embrace of Christianity was not irrational as such; indeed, he characterizes himself as a "rationalist," and submits rational reasoning on behalf of Christian truth claims. But he also makes clear his conviction that the success of reasoning as an approach to truth is heavily dependent on its first premises, and that the latter can be as (or more) validly grasped by intuition as by reasoning alone. (More on this below.) Another very valid and important insight here, IMO, is the assertion that the acceptance of big ideas (such as Christianity, or any other worldview) is not usually the result of one intellectual tour-de-force of reasoning, but rather the gradual result of a myriad of observations and impressions from many areas of human experience, all finally recognized as tending in the same direction. (I would add that this latter point tends to reinforce my conviction that people usually are not "argued into" believing in Christianity. Dealing with honest intellectual questions about Christian evidences is legitimate and helpful, both for believers and non-believers, but I think people accept Christianity, if at all, when they're ready inside --psychologically, emotionally and morally-- to do so, and not before. )It's impossible to summarize the thought of a nearly-300 page book in a short review. Some of Chesterton's major points, however, are that Christianity uniquely meets the paradox of apparently opposing human psychological needs; that the moral critique of the existing order implicit in the doctrine of the Fall provides both the psychological spur for social reform and a consistent ideal for reform to aim at, in ways that some of the rival philosophies do not; that philosophies based on negation necessarily wind up negating the basis for confidence in Reason itself; and that a priori rejection of all empirical evidence for the miraculous on the grounds of its metaphysical impossibility is the opposite (not the epitome!) of evidence-based investigation.Critics of Christianity who aren't ready, in the sense I referred to above, to be convinced obviously won't be convinced by this book. This is particularly true of spokespersons for hate-based "New Atheism," a few of whom have generated trash talk about Orthodoxy based on a "I'll hold my nose and read this horrible #@1*&(: just so I can expose its infamy to the world" approach. That's not an approach that usually produces any results that are intellectually worth replying to; but it might be pertinent here to address a few howlers. First, Chesterton does not attack reason as such here; his factual demonstration that insane people are often rigorously "rational," given their premises, isn't designed to prove that reason itself necessarily leads to lunacy, but that reasoning based on false premises can support lunacy. Second, the role of his references to "fairies" in the chapter "The Ethics of Elfland" and elsewhere in the book are clearly metaphorical, used in much the same way that his contemporary Francis P. Church uses Santa Claus in his famous "Yes, Virginia, there is a Santa Claus" editorial (which also makes the statement, "You might as well not believe in fairies!" :-)); they serve as symbolic embodiments of a dimension of reality that includes the mysterious, the affectional, the intangible and immeasurable, that melts the hard iron "practicalities." (It's a metaphor, of course, with a humorous cast; and fanatics of any stripe aren't psychologically well-equipped to appreciate either metaphor or, especially, humor.) Third, Chesterton's contrast of Zola and Torquemada, in one of his characteristic paradoxes, neither states nor suggests that the former was morally inferior to the latter --their relative merits aren't even the subject of the contrast!The 1908 diction here is clear enough for the average modern reader, and the book is actually a fairly quick read, except where you have to take some time to digest the thought. Some British place names, and a few references to other writers/thinkers of Chesterton's day, will be unfamiliar to most modern American readers; but the substance of the thought, and the issues being dealt with, aren't at all dated. I would recommend the book highly to readers of all stripes who enjoy grappling with serious ideas and existential questions. When I first started reading this book, I was dumbfounded, and I quickly sensed my vulnerability. I’m used to reading challenging authors who work hard to drop-kick your old paradigms and hold you teeth-down to the grinding concrete they’re speeding recklessly over in pursuit of truth. I can sense when an author is sliding towards sensationalism and theatrics in his attempt to convince readers that their life is a sham and essentially a waste of time. I even like it when authors do that, because I become so desensitized to it that much of authors’ fervent exhortation comes across my ‘reader’s-block’ as hardly a compunctive tickle. But Chesterton, called by Philip Yancey the ‘prophet of mirth’ for his playful manner, plays cat and mouse with his audience just about as well as I’ve ever experienced. He really spooked me initially, and though I think I finally fought my way out from under the crushing weight of some of HIS more untenable theses with some of my ideas intact, yet I’m not sure I’m the same person. Chesterton makes you feel like you've never done any real thinking before this moment, or that until now you have been evading the truth all along to coddle your pet delusions. Remember those annoying kids from 3rd grade who would wait until you were resting your chin on your hand, and they’d ever so slightly bump your elbow, knocking out your chin rest? Well, I was one of those annoying kids, and I relished observing the resulting shift in balance that was enough to make the whole body jerk as it overcompensated to stay in charge. It is precisely in this way that Chesterton wakes a person from their philosophical stupor—by relentlessly poking at an idea that may not seem to underpin the whole system, but the whole comes crashing down to reveal what a small, unlikely, pitiful rivet held it all tenuously together. He is a jester that playfully and ironically disarms his opponents, then urbanely turns their own weapons against them to reveal the sharpness, or dullness, of their own points. There were times while reading that I found my arguments suddenly naked and defenseless before the might of even his most flippant, tongue-in-cheek remarks. I loved and hated it.The reason why I hated it is obvious—it’s uncomfortable and cumbrous to get through because it’s so startlingly fresh and painfully alive—like rich blood to a sleepy limb. But he's fighting for us. He asserts our right as common men and women, mundane thinkers but strong in action, to make decisions befitting kings and queens of creation. We are born into a world that we must first be loyal to, because we are grateful, but we must also reform it into what it was meant to become. We have the right to dream, and we have the duty to act, and this is exactly what Chesterton's ideas free us to do. If there was ever a person that felt cowered by the giants of secular academics bloated with information, or left behind by the awful speed of cerebral athletes—then Chesterton is flying his beautiful banner of ideological democracy over you.My more negative critique would touch on Chesterton's defense of Christianity as if it were the only thing of its type. In one sense it is, but only inasmuch as every religion is a unique blend of conservatism and progressivisim, of thinking and action, of love and truth. If Christianity is special as a balance of the gamut, then Bhudism/Islam can be thanked for being the extremes that help define the moderate, although I’m sure every belief system prefers to view itself as the mean and not the extreme. I'm not in agreement with the broad strokes which Chesterton paints non-Christian religions with, but I do love his idea of the perfectly balanced belief system (Christianity in his mind) being a precise balance of 'furious opposites'. This is nothing new in philosophical thought: Aristotle has his virtues, Hegel his dialectics, Jung his tension of opposites; but Chesterton's idea is somewhat original in that it preserves the full energy of his ‘opposites’ in equilibrium instead of abating their energies at an impasse.I wasn’t sure about the title when I began this book, and I received different perspectives as to whether or not Chesterton meant it to be tongue-in-cheek. But, in my opinion, the author’s label is spot-on. It is an authentically orthodox perspective, but with an original expression of its rationale. There was nothing he espoused in the course of the book that wouldn’t accord with the Apostolic creed, or with a fundamentalist approach to faith. He describes his journey to discover faith as much nearer in actuality to a rediscovery of orthodoxy, much in the same way that a seafarer arrives back on his own continent of departure unawares, all the while thinking he discovered a new land. This work is indeed a reaffirmation of general orthodoxy (of Catholic doctrine more specifically), but his approach is extremely clever, having the power to make his audience appreciate the role of tradition and orthodoxy that may be already present in their lives. In the end, I not only appreciated this book, but I felt that is was a wonderful reclamation of lost truth. Truth is not only discovered afar off through a telescope like a land we are journeying towards, but it is brought out from a back shelf and dusted off, dug up and unlocked from right beneath our feet. Truth is here! A Chesterton-like appreciation of orthodoxy, democracy, and tradition (all the same thing in his mind) might be in order for our generation of neophiles who are grasping for the far reaches of space, and losing what they have here to be crusted over with the slow deposit of forgetfulness and one day make rediscovery of local truth seem like landing in a new world. Chesterton is witty but dense; his reasoning requires concentration. If I am reading him and not paying close attention to the trajectory of his thought, I find myself saying, "What is he babbling about? What does this have to do with anything, let alone Christian orthodoxy?" If I am paying attention, however, I often find him extremely insightful, and I wish to highlight nearly ever line. I also find him quite contemporary; what he says seems to apply somehow to every age. This is not apologetics; it is not quite spiritual autobiography either. It is wit, and reason, and persuasion, and conversation. It's Chesterton. How else is there to put it? As an orthodox Christian who has sometimes struggled with the doctrines of my own faith, I found this work bolstering and refreshing and encouraging; I particularly liked his discussion of the importance of the doctrines of Trinity and Original Sin. This was my umpteenth time reading Orthodoxy. For years I had the audio version on my iPod Shuffle. Hilariously it played the chapters out of order, but it didn't really matter. I listened to them over and over again. it was fun to go back and read it in print again. And as other of my friends have said, even though I am one of the dreadful Calvinists, I still love Chesterton and his masterful way with words. Since I read it on my Kindle I will share my highlights that way. I am looking forward to our next book-club reading on Chesterton's wife. The title belies the true depth and value of this book. Chesterton writes, ostensibly, to share his own conclusions about why Christianity is true and worth following. But the book is so much bigger than that, just as it is so much more intimate than a mere treatise on orthodoxy. Chesterton offers clarity of thought and imagination and wit. Every single page offers something interesting and new to chew on. I’ll be returning to this one over and over. 3.5 stars.This would have been 5 stars, except it went way over my head in the last 3 chapters or so. The first three-fourths of the book were absolutely brilliant and insightful and, with a little extra time taken to ponder, fairly easily taken in and understood, which I can appreciate, being a silly and easily befuddled young'un.You ever read something and you think, "Man, that's deep. I know this is genius, but I can't quite wrap my head around it", and then your brain starts to hurt, but you feel somehow smarter?? That is Chesterton, 90% of the time. And about 70% of that time, I can "get it", if I re-read a couple times. And he is so worth it. Controversial, but brilliant. Striking, but baffling. Quotable, but confusing.I almost gave this five stars -- the content is certainly profound and incredible at some points -- but the methods in which Chesterton tackles his ideas are too tangled up and confusing. He makes large leaps in his logic, leaving the reader no room to catch up before going on. While Chesterton repeatedly describes his ideas through pictures, often these explanations still aren't sufficient -- he fails to remember that people are not inside his intellectual mind and can't always make the same assumptive jumps. His pithy statements are often incredibly lucid, but much of the time he somehow he still manages to be confusing, too quick, and easily misunderstood. "The poet only asks to get his head into the heavens. It is the logician who seeks to get the heavens into his head. And it is his head that splits. "This book looks small and straightforward on the outside, but Chesterton packs a punch in here. I would not recommend this to people looking for a simple case for Christianity. This text demands to be plowed through patiently; it contains uncomfortable philosophical counterarguments that must be wrestled with and untangled from a muddle of ramblings. "A martyr is a man who cares so much for something outside him, that he forgets his own personal life. A suicide is a man who cares so little for anything outside him, that he wants to see the last of everything. "I wonder if Chesterton thought in platitudes like this on a daily basis...? Available online.My first Chesterton book. It was slow-going for the first few chapters, but I enjoyed it more as I went on. This book has come up again and again, and I really need to read through it again. Having interacted with it on a deeper level since the first time I read it, I think that I'd give it five stars if I read it again.Here's Piper on why Chesterton's anti-Calvinism isn't completely off-putting. Here's N. D. Wilson on Chestertonian Calvinism. One of the three most influential books in my life outside the Bible. This book would have made me Catholic, if I wasn't already. It also kept me a Catholic, as I was on my way out of the Church before I read it. It confirmed me in my Catholic faith, made the Church make sense for the first time, and set me on the way I'm still traveling. It gave me a vision for where I was and where I was going. I'm still on my way. This is the third time I have read Orthodoxy by G.K. Chesterton, and I hope it will not be the last. Written near the beginning of his career, it is by far his best book on the subject of religion. Although he was to return a number of times to the same well, the water was fresher in 1908, some fourteen years before he made his decision to convert to Catholicism. Afterwards, there was an institutional tinge to his writing that vitiated many of his later efforts.As a lapsed Catholic, I was surprised to have forgotten that he was still an Anglican when Orthodoxy was published: As I followed his arguments, I thought they were equally relevant to Catholic belief:Mysticism keeps men sane. As long as you have mystery you have health; when you destroy mystery you create morbidity. The ordinary man has always been sane because the ordinary man has always been a mystic. He has permitted the twilight. He has always had one foot in earth and the other in fairyland. He has always left himself free to doubt his gods; but (unlike the agnostic of to-day) free also to believe in them. He has always cared more for truth than for consistency.There are few writers as quotable as Chesterton. He deserves to be read slowly, one chapter at a time. It is so easy to lose his train of thought in the succession of paradoxes that is so characteristic of his writing.And now the Catholic Church has begun the process toward canonizing Chesterton as a saint. Are we ever going to be ready for Saint Gilbert? I already am, as I have always regarded his work as keeping me within hailing distance of my own past of Catholicism (along with Thomas Merton, Francois Mauriac, and a few others).All the towering materialism which dominates the modern mind rests ultimately upon one assumption; a false assumption. It is supposed that if a thing goes on repeating itself it is probably dead; a piece of clockwork. People feel that if the universe was personal it would vary; if the sun were alive it would dance. This is a fallacy even in relation to known fact.It was the Argentinian writer Jorge Luis Borges who pointed the way to Chesterton. Originally, I read his fiction, then his essays; and now I am reading his religious works. When I first started reading Chesterton, I was dismayed to find that so few of his works were in print. Now, most of his work is available; and more is becoming available every year. The Ignatius Press in San Francisco has slowly been putting out a set of The Collected Works, of which I currently have all the volumes. It is a mammoth task, because Chesterton was a wildly prolific writer and journalist who appeared in dozens of publications throughout the English-speaking world. Reviewing G.K. Chesterton's Orthodoxy is a daunting task, given the purpose of the book, his sophisticated and subtle commentary, and the nature of the subject. Nevertheless, I'll try to write a response that will enable potential readers to determine what Chesterton wrote about, why, and how successfully.Already I find myself laboring to pull salient points and summarize arguments from Chesterton's book. The main thing to understand is that this book isn't an apologia for Christianity; I believe his later work The Everlasting Man is that. It is, rather, an apologia for Chesterton's Christian faith demanded by readers of an earlier work, Heretics, in which he took on philosophies current around the turn of the twentieth century. Amazingly, Orthodoxy retains a freshness about it because these philosophies, that of materialism and determinism, modernism and skepticism, still dominate Western cultural thinking. Chesterton even tackles what he calls "oriental" thought and Buddhism, reminding modern readers that what seems New Age has been around for quite some time.Although a one-sided defense, Chesterton's reasons for coming to believe that the Christian faith is the only tenable position have a powerful ring of sincerity, hope, and intellectual rigor. Even if they aren't moved to share his conclusions, thoughtful readers will find it hard not to respect Chesterton's passionate and eloquent belief. I LOVED Orthodoxy. I feel like I barely skimmed the depths of it. I am definitely going to re-read this one many times. Chesterton is utterly brilliant and reading him is like thinking on a different level. It took me a while to get through this book because I felt like I needed to take it slowly. I don't know where to begin with this book, primarily because I feel like I have only just begun. I feel like I have been stretched on my thoughts about stories, worldview, and the role of joy in the Christian's life. I don't think I always agree with Chesterton...but I enjoy reading his point of view.I understand C.S. Lewis so much better as I read Chesterton. Lewis’s works feel like the natural outcropping of Chesterton’s ideas. Very happy girl here. Can't wait to re-read this one and get some more Chesterton! I will probably write a more thorough review once I have had a chance to digest it more. Brillante, lúcido. Escrito hace cien años, y narra los errores de hoy. El capítulo VIII es profético. Pero sigo poniendo por encima El hombre eterno. 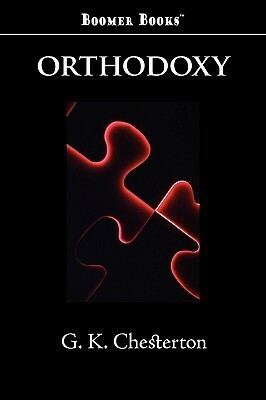 this review first appeared on [http://intraspace.blogspot.com]i've finally finished reading his book 'orthodoxy'. it looks little, like a quick read, and then it isn't.this book seems to have had a revival in the last couple of years. it's recommended by philip yancey, john eldridge mentions it a lot in his writings, and relevant media (purveyors of christian cool) have just released a version under their imprint. i suppose it was also considered a 'christian classic' before this recent press - i've heard that it was instrumental in bringing c.s. lewis to faith.the book was first published in 1908. there are aspects of it that seem a bit dated in 2006 (his examples more than his arguments). i found it a bit hard to get into for the first couple of chapters, but it took off after that. there were certain passages that were that kind where you stop reading for a couple of minutes because they are so powerful and they take some processing. while chesterton's arguments are often quite compelling, i found it just as useful for stimulating my own thoughts and ideas. the book is in the same category as writing by c.s. lewis if that's your cup of tea. G.K. Chesterton is a rhetorical master, and nowhere is his virtuosity on better display than in Orthodoxy. This book is saturated with classical rhetorical devices, so it may be a bit heavy-handed for modernists. If you enjoy a clever turn of phrase and a top-notch wit, Chesterton is hard to beat.Orthodoxy is noteworthy for its substantive content as well. In this book, G.K. defends Christianity against the amoral relativism of his day (the turn of the 20th Century). His primary foil is George Bernard Shaw, but he takes several shots at H.G. Wells, Tolstoi and other contemporaries. Familarity with their ideas is helpful, but not essential. G.K. tracks his own intellectual conversion from secularist to modernist, turning a good deal of conventional wisdom on its head. The finished product is a resounding endorsement of Christianity with all its beatuiful paradoxes.Among Chesterton's admirers is C.S. Lewis, so any Lewis fans should give Orthodoxy a try. Chesterton is so quintessentially quotable that I thought it would be fun to try filling a commonplace book of nothing but Chesterton quotes. But then I gradually realized that this work is a commonplace book of nothing but Chesterton quotes so that making my own would simply be redundant. Orthodoxy is filled with one brilliant moment after another, but the book as a whole seemed a bit haphazard, like it might have a hard time passing a sobriety test. But maybe that's the point: the wild and unpredictable excess of God's fairy tale world spills over onto the pages of the book. While I really did love every minute of this book, I came away with the impression that (dare I say it?) the whole is, perhaps, lesser than the sum of its parts. But that is not to say you shouldn't read it a dozen times over and try to memorize most of it before you die. He says some of the main things without exploring them further. If he did explore those ideas it would have to go in a different book. Sometimes after saying something deep he retreats and says something more straightforward, and he can be funny at times, Chesterton's being the person whom he describes in the beginning of the book(kinda). I would say it is a good book for understanding the 'summary' of some of the main problems in Atheism and Agnosticism and the critiques of Christianity. G.K. Chesterton - Gilbert Keith Chesterton (1874-1936) was born in London, educated at St. Paul’s, and went to art school at University College London. In 1900, he was asked to contribute a few magazine articles on art criticism, and went on to become one of the most prolific writers of all time. He wrote a hundred books, contributions to 200 more, hundreds of poems, including the epic Ballad of the White Horse, five plays, five novels, and some two hundred short stories, including a popular series featuring the priest-detective, Father Brown. In spite of his literary accomplishments, he considered himself primarily a journalist. He wrote over 4000 newspaper essays, including 30 years worth of weekly columns for the Illustrated London News, and 13 years of weekly columns for the Daily News. He also edited his own newspaper, G.K.’s Weekly.Chesterton was equally at ease with literary and social criticism, history, politics, economics, philosophy, and theology.